Small business want leads. It is amazing just what they will do for them. This was a great find in the parking lot of Rustic Canyon one day. 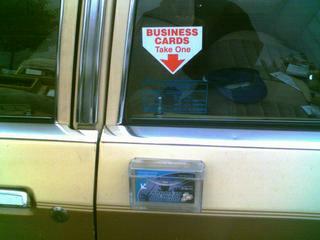 This guy had literally glued a business card holder to the door of his car so people could pick up a card. It is this agreesiveness in doing things that work to drive new customers, we want to tap into at MerchantCircle.